Entomology, approach… why “disturbing notions”? Because their high value in flyfishing tend to “disturb” the angler from the cast and the catch of his quarry! Entomology is without any doubt a wonderful science and its knowledge is of great help to flyanglers. But this “article” is intended for beginners and its goal is to attract more and more people to flyfishing avoiding any complexity. For this reason, let’s start from the simplest points. 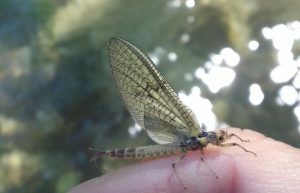 Going deeply into entomology is not compulsory for the flyangler: having a good idea of the differences between mayflies, sedges, stoneflies, terrestrials and midges is often (not always…) sufficient. They are all insects – except terrestrials – having a life cycle starting from an egg laid under or on the water surface and developing into adult through a more or less complex metamorphosis. Mating, egg laying and death of the insects close their life. Distinguishing the various “groups” of insects, especially during their adult stage, is rather easy: Ephemera (mayflies) have their wings in vertical position (V), Trichoptera (sedges or caddis) show their wings tent-like (/\) while in Plecoptera (stoneflies) they are flat on the back of the insect (____). Midges are similar to mosquitos while Terrestrials have different shapes and colours: they represent all those small insects not living in the water and which may fall on to the river surface by accident (wasps, bees, crickets, butterflies, ants, caterpillars, grasshoppers…). Being able to identify Ephemera danica from Ephemera guttulata or Ecdyonurus venosus from Baetis rhodani, not to mention the difference from male and female, is very satisfying and interesting. Nevertheless, it is not compulsory to catch fish given that the basic criteria are kept in mind as far as choosing the correct pattern (shape and silhouette) and proper casting are concerned. Some consider this kind of identification extremely important or give basic importance to colour and hues of the body of the insect; all this causes even more confusion to the already complex world of fly fishing. In most cases, the under part of the body of natural flies is lighter than the above half. This is Nature’s camouflage: predators attack from below and a lighter body helps being not detected from a distance against the bright colour of the sky. In spite of this, when tying our flies we decide to copy the upper part of the insect’s body or its overall colour (greenish, yellowish, reddish, greyish…) thus obtaining an artificial which does NOT reproduce the natural properly. As a matter of fact, this is NOT very important to the fish’s eyes because we DO catch fish with these “wrong” imitations. So, why do we catch fish? For sure, not only because of the color. For sure, fish are not scientists nor scholars and feed on anything they consider eatable, without caring of Latin names and/or color hues. There are many exceptions to the above theory (particular water or light conditions, extremely shy or overfished fish…) but in most cases our success is due to the proper presentation, the delicacy of the cast and to the correct path followed by our fly. In other words, the fly should go where fish expect it to be. Basic colors might have their importance but hues or shades are less important. Fish see the fly against the sky or the sun and when they approach the insect from below they see but a black or dark shape of the fly while colous and hues are undistinguishable. The important point is that WE must be able to see the fly, to detect it during its downstream trip and be ready to strike. For this reasons flies should be first of all visible by the angler when in bright water, with a clear, white part or wings (to be detected in darker spots or in dim light conditions). Fish have a good sight but not so extreme and are not able to notice the difference between thin or stronger tippets (within a certain range). Many anglers insist on the importance of a 0,08 mm against a 0,12 mm. If fish were able to note such a small difference (0,04mm!!! ), they would also spot the hook point entering the water… or the exceeding number of tails of our artificial fly… or the last part of the tippet protruding from the hook eye and laying onto the water surface. Water disturbance is probably more important than a correct fly. Stepping into the water should be avoided if unnecessary. If we are somehow obliged to enter the water, wading should be as careful as possible, to avoid the propagation of sound or noises through the water and river bottom. To finish with, a question which may arise a tornado: can be flies considered as specific for certain fish? In other words: are there flies for trout, flies for chub, flies for grayling, etc? Let’s suppose a river contains all the above fish in the same pool or riffle and we are fishing with a Bivisible, mostly considered as a fly for chub. Should the above question be positive, we would not catch trout and grayiling but chub only. The same is if we use a Red Tag (considered as a grayling pattern by most anglers): neither the trout nor the chub should accept it. This never happens: fish feed on what they find on the water, if considered edible, and don’t refuse a certain pattern simply because WE consider it for a specific fish. Flyfishing is not – and never has it been – an exact discipline and any day you may find something new, in spite of your long lasting experience. The more you keep things clear and simple, the more your knowledge will increase and the more fish you’ll be able to catch. Previous PostFishing guide: things to be remembered for your best trip. Next PostEnte, a small surprising stream not far from Viterbo.